Experts gathered on Pi Day to discuss the incredible future of space exploration. In 10 to 50 years, spaceflight might take us to the surface of the Red Planet, to the discovery of an Earth-like exoplanet and beyond. But, according to a group of experts, this future will depend on international collaboration, determination, and increasing access to space for people around the world. This Pi Day (Thursday, March 14), scientists, astronauts, artists, engineers and designers gathered to discuss our future in space as we near the 50th anniversary of the Apollo 11 lunar landing. The event, called "Beyond the Cradle 2019: Envisioning a New Space Age," hosted speakers ranging from former NASA astronaut Leland Melvin to Marc Okrand, a linguist who invented the Klingon language, and even glass artist John Simpson. These speakers took a keen look at how art, science fiction, space exploration, technology and more all work together to advance space exploration and spaceflight. 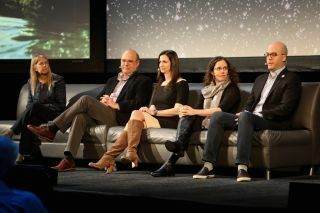 The event, which took place at the Massachusetts Institute of Technology's Media Lab in Cambridge, also included workshops and Q&A's, which allowed audience members to participate. At one panel, a diverse group of professionals gathered to discuss what space exploration might look like in 10 to 50 years. Moderator Dava Newman, an Apollo program professor of aeronautics and astronautics and engineering systems at MIT, led the panel, which included Leon Alkalai, a JPL fellow and manager in the Office of Strategic Planning; Sara Seager, a professor of physics, planetary science, and aeronautics and astronautics at MIT; Erika Wagner, a payload sales director at Blue Origin; and SpaceIL co-founder Yonatan Weintraub. Seager, whom Newman described as "the guru of everything exoplanets," discussed how, within the coming decades, "what we really want to do is get down to the level where we can find a true Earth, a planet like our own, around a nearby star." This ambitious goal, she said, is within reach but will take significant financial investment and determined, hard work. While new planets will be discovered quite frequently as TESS continues to explore the cosmos and search for Earth-like planets, it will still be an uphill battle to definitively locate a true Earth, Seager explained. Wagner touched on the subject of the changing way that people are able to gain access to space, and how the way we interact with space might change with time. "How do we open up space to tourism? How do we open up space to art and humanities and all the other things that make us human?" Wagner asked. She also added that, including tourism, increased access to space — including access to CubeSats — is necessary for progress. "Space doesn't grow if we are continually taking the same pie and just slicing it smaller and smaller," she said. Weintraub shared a piece of the story behind SpaceIL, the startup he co-founded with the initial hopes of winning Google's Lunar X Prize. No one ended up winning the prize, but SpaceIL has continued to make incredible progress, recently launching its first craft to the lunar surface. Weintraub said, "Eight and a half years ago I sat down in a bar with two friends and as the alcohol level in our blood rose, we became more and more determined … less than a month ago, we actually launched it, and it's on its way to the moon right now." Weintraub added that collaborating with NASA helped to make the mission possible, paving the way for future private companies to collaborate with existing space agencies. Weintraub cemented the thrilling success of SpaceIL's mission thus far when he shared a "selfie" taken by SpaceIL's lunar lander on its way to the moon. Alkalai agreed with Weintraub that collaboration will be essential to future exploratory missions. Alkalai's work with NASA's InSight mission to Mars, he said, exemplified this truth, showing not only what is possible through collaboration, but also the importance of international cooperation, specifically. French engineers worked alongside researchers at JPL to develop a lander that was equipped with state-of-the-art instruments to study the Red Planet. Alkalai also likened the international collaboration, which supports progress in space exploration, to his journey as a naturalized U.S. citizen, adding that when he travels with others in his field they are "kind of looked at as citizens of the world." The theme of collaboration continued when, in response to a question from the audience about how science, space exploration and policy should interact and how involved scientists should get in policy, Newman said that "scientists and engineers, we can't just live in our labs. We have to step up and do more, and apply what we do to policy in order to have impact."